I completely agree with you about the lack of enjoyment in this title run. You can really feel the pressure of it. Every time my mind wanders to May, I have try think about something else !!! Still you have to hand it to the players, one league defeat by mid January is impressive. Hopefully they'll recharge their batteries in sunny Dubai & we'll have fewer games like Saturday. "He's got the most Everton face ever him" - I love that !! When I finished laughing, I did think that everyone is saying when we click, we'll be great but the question is WHEN will we click ?? Your first two paragraphs summed up EXACTLY how i felt, never relaxed at all ! Plus after the final whistle, i said we'll get Dortmund, probably the best team in the competition but you're right, it'll be a much nicer tie with none of the nasty undercurrents. Great review. Great stuff Dave, always my favorite part of the fanzine. Borini the Lion captions are excellent. When is Gerrard's trial, thought that was supposed to be in July ?? I was at that match and these hats were being given out outside the ground and when I was handed one, I handed it straight back. Any one know when the final of Quiz is Anfield is on LFC TV, can't find it on any listings. Can I point out that I have a picture of the Shankly Gates on my bedside table and would have not problem with a picture of Kenny over the bed, though my husband, the Arsenal fan might have a problem with it !! My brother was just in HMV in Blanchardstown and they don't have it and said they don't know if they will get it at all. I have never posted on this forum before though I read it regularly but I just got really angry about the comments re. overseasers just voting for the big names. 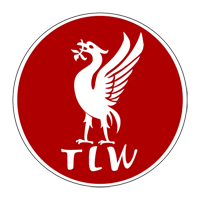 I'm an overseaer who subscribes to TLW fanzine and rarely reads the official website. I think Carra has been IMMENSE this season and imo is the Premiership Player of the Year. I think Gerrard has been very hit and miss this season - his head is obviously elsewhere - even I, as an OOT can see that. Please don't tar us all with the same brush.